Walking into a Fast and Furious movie you must forget everything you’ve learned from science and completely dispel the laws of physics. Gravity doesn’t exist in this universe. And to tell you the truth, I’m fine with that. My favorite aspect of this series is that the movies have progressively gotten better, at least since 2 Fast 2 Furious. The stunts have gotten more extreme, but the quality of the movies themselves have gone up. Until now that is. It’s hard to wrap my head around this with James Wan stepping into Justin Lin’s position as director, which Lin has handled for the last four Fast and Furious movies (progressively getting better and showing growth as a filmmaker and storyteller). The prospects of the talented Wan directing a big-budget Hollywood feature was promising. It didn’t live up to my personal expectations or show growth from a series which had me, lost me, and regained my confidence once again. 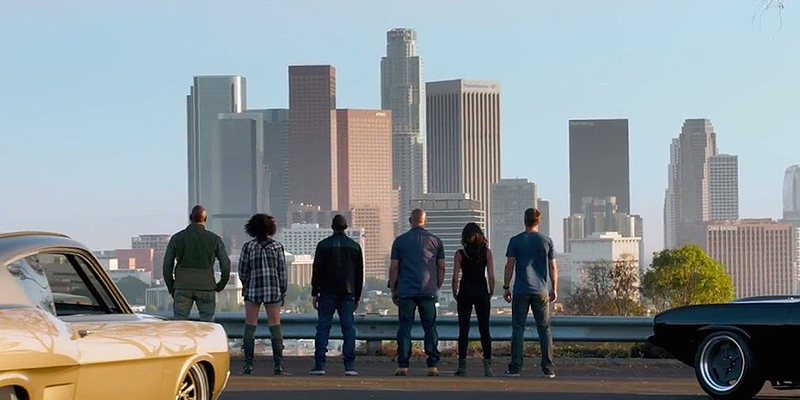 While Furious 7 takes a step backwards in the series, it’s still a fun ride. 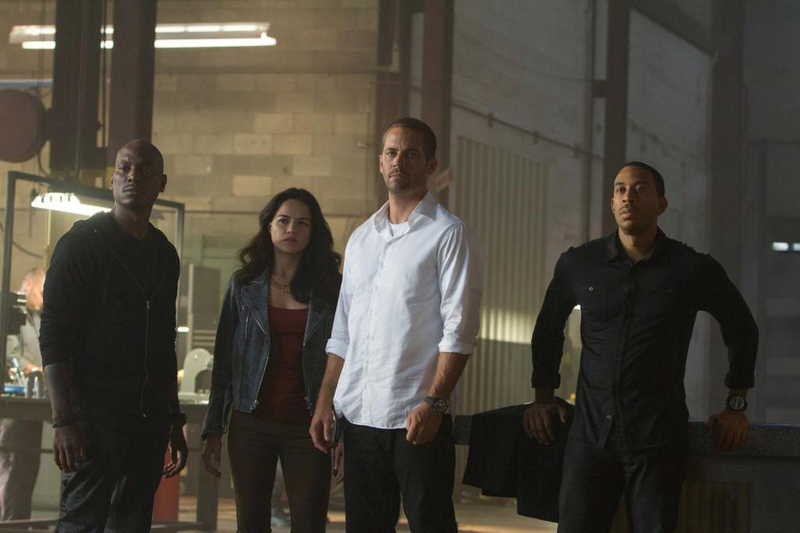 The plot of Furious 7 is extremely simple. Owen Shaw in the last installment, the crew must face his bigger, badder brother Deckard Shaw (Jason Statham). That’s pretty much the extent of the plot. Besides the crew having to save a hacker from some terrorists before the big show-down with Shaw. So where did things go wrong? Well, first you have to look at the editing. It’s cut together like a terrible pop music-video. The film bounces from location to location which isn’t the problem, it’s the execution. It’s always the same. They start with a wide panning shot of the city, quick cuts on woman’s butts, drinking, dancing, and then the scene begins. If this had happened once or twice throughout the film, I would have been fine with it. It just made the movie feel disjointed and montaged together to make it feel like a cohesive picture. Many of the fight scenes were not all that impressive. The camera moves quickly and is hard to follow. Wan does a camera trick where he flips, twists, and moves with the action, which looked great during the opening fight scene. However, when he used it throughout the entire movie, it got old quick. Now listen, I know the film was plagued by all sorts of problems- most notably the passing of Paul Walker, which would impact any movie or filmmaker. So while I’m not an apologist for the film, I commend everyone for putting together a decently entertaining movie. They handled the Paul Walker situation gracefully, and gave him a good sendoff. So far I’ve pretty much exclusively talked about the bad in Furious 7. There was enough good in the film to save it from being a complete misfire. Dwayne “The Rock” Johnson was fantastic. His one-liners in particular were hilarious and were some of the most memorable one-liners since the golden age of Stallone and Schwarzenegger. Many cast members were given great one-liners, The Rock just has that certain level charisma that makes him stand out above the rest. Tyrese Gibson provided the comic relief and was genuinely funny throughout. Everyone else did fine with a somewhat uninteresting and weakly written script. And while being critical of the aesthetics and camera movement during fight scenes, it won’t ruin your average fans enjoyment. There are plenty of scenes are amazingly over-the-top and a lot of fun. The films have continued to step their game up by upping the stunts every movie, and Furious 7 will not disappoint in that respect. It’s a fun movie with a bit of heart. I expected more with James Wan stepping in to direct the movie, but under the circumstances he held it together. These are not easy movies to direct and now have a whole new level of respect for Justin Lin. As long as you don’t expect too much, especially related to the laws of science, Furious 7 will be a fun drive, albeit a tad long at 134 minutes. 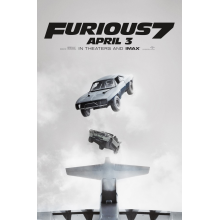 Furious 7 opens in theaters April 3rd, and stars Vin Diesel, Paul Walker, Michelle Rodriguez, Dwayne Johnson, Jason Statham, Tyrese Gibson, Kurt Russell, Ludacris, Nathalie Emmanuel, Djimon Hounsou, Lucas Black, and John Brotherton.